Over the years I’ve had a chance to try my fair share of glues. Yellow glue, white glue, super glue, epoxy and polyurethane. After trying a few different brands I’ve narrowed it down to the one that’s been coming through time and time again. I remember the first time I was introduced to Gorilla Polyurethane Glue. I was picking up some sandpaper at my local mom & pop hardware store and the Gorilla Glue rep had just visited before I got there. Anyone ever glue end grain to long grain (think a letter “T”)? If you have, would you trust the glue to hold the joint together? I wouldn’t, but just then the clerk handed me something that would make me question what I was seeing. The glue joint had been hit repeatedly with a hammer, but amazingly the wood itself failed before the glue did. I don’t use polyurethane glues nearly as much as I do my yellow glues (also with the name Gorilla on it). But when there’s a need for them, Gorilla Glue is my go to brand. And now with their new Anti-clog cap, going Gorilla on a glue-up is easier than ever. – Stainless steel anti-clog pin. – New wing nut grip cap for easier use. 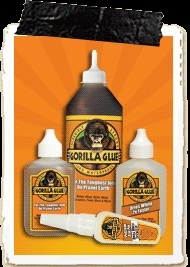 To learn more about Gorilla Glue visit www.gorillatough.com. Nice. I’ll try it out on my tool cabinet build in the next couple of weeks. Good to see someone not totally dissing [how does anyone ever spell that] Gorilla Glue. It has its place. And used in the right context it is a great glue. It is not gap filling like one would expect. But if one anticipates the foaming and if one remembers to wear gloves when using it, good results can be had. It’s redeeming qualities are that if one is glueing green or unseasoned wood and if you are glueing something that will be used outside. Gorilla Glue is the good choice. BTW they make great duct tape and PVA glue. I’ve been using the Gorilla PVA glue almost exclusively for over a year and haven’t looked back. I don’t use the polyurethane glue nearly as much as I once did, but when I have a job that requires it, it’s nice to know it’s there.